Instead of the hassle of trailering your boat to an expensive repair shop or dealership, we can complete most repairs at your dock, marina, boat slip, on your lift, in your driveway, or wherever your boat is located! Our mobile service can be at your boat sometimes even the same day, and with an onsite inventory of all the common parts and lubricants we can get you back on the water immediately! 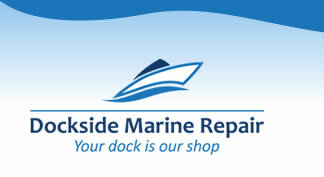 Dockside Marine Repair is a family-owned and operated business. Because it is also owner-operated you will always know your repairs will be completed by someone with 15years+ experience with boat repairs and a lifetime of boating experience. We not only know about mechanics, but we fully understand how boats are enjoyed, driven, maintained and stored in the northwest and can more easily identify problems and recommend solutions as well as preventative maintenance. With the latest diagnostic equipment and tools to perform most any mechanical repair.